It was 48 years ago this evening that legendary radio comedian Fred Allen suffered a fatal heart attack while walking his dog. I'm way too young to remember them myself, but the more I read about them and listen to them on the old-time radio shows, the more I realize this was a really great show-biz couple. I mean, Portland was named for her birthplace in Portland, Oregon, and she had a sister named "Lastone" because she was supposed to be the "last one". How can you not like a family like that? I agree. Myself being too young to hear Fred the first time around, I discovered his radio program back in the 1970's on an LP record. 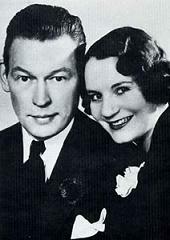 Since then I've heard Fred Allen and his wife on the many recordings available, especially on mp-3 formated CD's. Fred Allen and Jack Benny guested on each others shows, as they fought their long running "fued". becoming more well known in the new medium of television.